How can I add, a single shurtcut of a program from starting menu to desktop? Right click on the shortcut in the start menu and select copy, then right click on the desktop and select paste. Or put the mouse curser on the start menu shortcut, hold the Ctrl key and left mouse button, and drag it to the desktop. Running this on dual monitors. 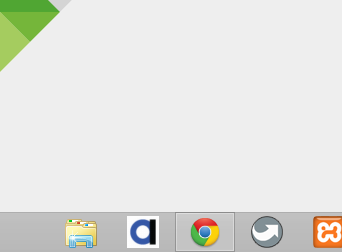 Primary monitor - Plain taskbar, no start menu, just pinned apps and active apps. Placement on the left (verticle) side. Secondary monitor - Start menu , identical pinned apps and acitive apps. Placement TOP (horizontal) of screen. What i have noticed is if I click on the left upper corner, or within the area of the taskbar, the Windows Start menu will display, but there is no Start menu button visble. This shouldn't occur. I have the Start Menu on the secondary display on the top taskbar. 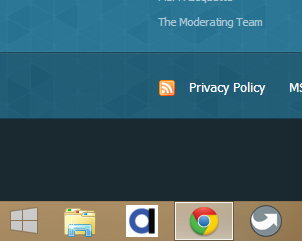 I've also noticed that there is a large gap, normally where the Start Menu would display, between the top of the taskbar to the next icon. If you click on one of the apps or the taskbar everything moves up and displays as it ought to. PS. It would be nice to add the ability to open the Start Screen in a minimized "windowed" view rather it go to the fullscreen view. Hello, I am a new member of the forum. I tried doing a search, and didn't see anyone else experience this but I was hoping someone else had run into this, and had a fix. I just updated to 1.5.2 from a previous version that was running fine with Win 8.1, and the Start is back menu was working perfectly, but as soon as I updated I can no longer get the start is back windows 7 start menu. Windows programs and features says it is installed, but using the windows search, says the app is not installed. I tried carefully placing my mouse, as I noticed previously if you go a little too far, it is the stock Windows "Start" menu, but it flat is not there. Registered just to stop in and say I love you. I really couldn't use Win8 without your program. It works and looks great so far. I hope you don't mind if we use it on virtual machines within the "registered" host. I am constantly experiementing and re-imaging so I'll be using it with many installations on the same computer. However, even VM's copied from my original OS are sure to come up as new hardware. Maybe I'll use the trial for those. Has anyone had experience with this and the newly release Windows 8.1 Update 1? Just curious if there are bugs or proceedures on how to install it or should it be uninstalled first then reinstalled? I just updated to the Spring 2014 update (the official name). SiB work's fine, there is only one small bug I've seen. When you are in a metro app, the start button actually disappears. Also, when you click the "missing" start button, it pushes you back to desktop, then opens the start menu. There is a bunch of minor issues on Windows 8.1 Update 1, they shall be sorted out before official release. I've been busy with my new job. i'm new here but i have a big problem with StartIsBack + config since the 1.5.1 version. Indeed, if i activate the bottom left corner, i can't use anymore the start button (button to go to Apps screen appears immediately). Please, could you tell me how to do to resolve this issue (objective : having start button when you arrive on bottom left corner, and Apps screen button on the extremity of the corner). adding glow behind text in jumplist will also add glow in the second column of start menu, can you do something about it? I have the same problem, and I am running 8.1 without update 1. Is there a way to lock StartIsBack+ 1.5.2? I'm testing it in a Windows Server 2012 R2 environment with employees using it. But the start menu items can be moved and dragged around, and out onto the desktop from the startmenu. Is there way to stop and lock all interaction with the menu? I see nothing in options. It makes it useless because employees are dumb and will screw every single thing up if they can. There's a Windows policy 'Prevent users from customizing their Start screen' ('Prevent users from customizing their Start menu'). It affects both Start screen and start menu, though. Can you add a feature that I wanted for several years. Opening several programs require that you have to open the startmenu several times. It would be nice if it would stay open if I press an additional key like CTLR while clicking an Item in the startmenu.